Along with Tom Ford and Betsey Johnson, Nicole Miller is the latest internationally known designer to bring her runway to Los Angeles. The event is presented by Glendale Infiniti and supports Stand Up To Cancer. 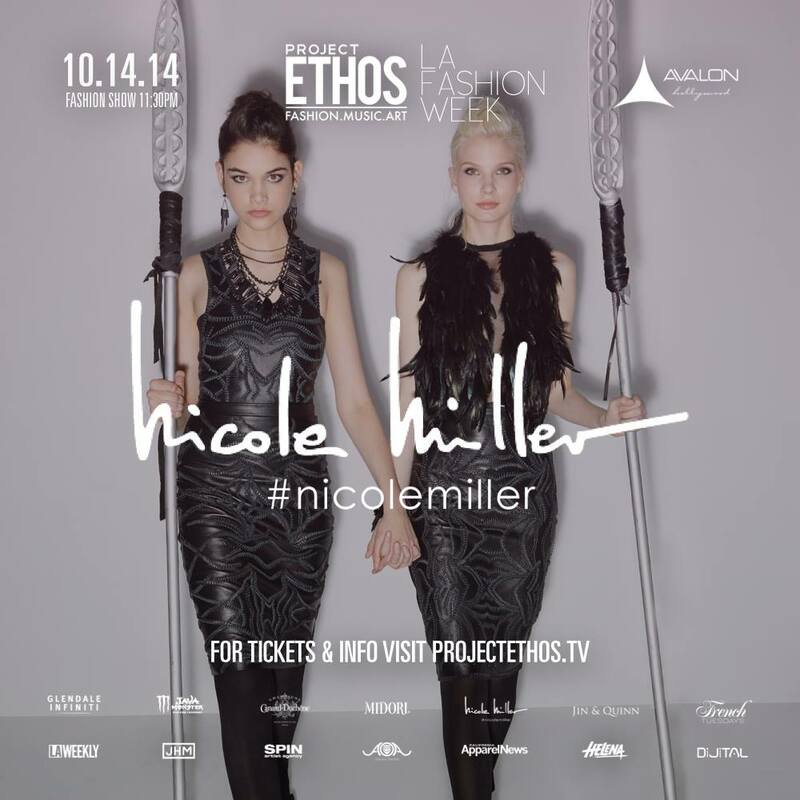 Project Ethos, LA’s most prominent open-to-the-public event, will return to LA Fashion Week on Tuesday, October 14th, 2014 from 7pm to 2am. The event is presented by Glendale Infiniti and will take place at the Avalon in Hollywood (1735 Vine St. Los Angeles, CA 90028). The night is powered by international luxury nightlife brand French Tuesdays with additional partners Midori, Java Monster, official stylists TNT Agency, Shop Ethos, LA Weekly, CA Apparel News and is hosted by TV Guide’s Nail Files personality, Katie Cazorla. “The Project Ethos team, collaborators, designers, artists and musicians will support Stand Up To Cancer by promoting an online donation page (live now and accepting donations) to all of their followings, family and friends. One can simply donate on the page or join the team and create their own donation page to promote. Headlining the nights’ festivities is a special presentation by American designer Nicole Miller. Launched over 30 years ago, the iconic brand has impacted every part of the fashion world from women’s to menswear and bridal. The 11:30pm fashion show will take place alongside a DJ set from Helena featuring Avalon’s state of the art lighting and sound. Emerging designer fashion shows take place at 8pm and 9pm. Designers featured include Chynni, creator of Indian fashion with American flair, fiercely feminine designs by MS Scandal, San Diego based Isabel Vianey, Amour Swimwear of Los Angeles, The Ashley Michaelsen Collection inspired by classic romance tales, Liberty Garden whose line supports Doctors without Borders as well as contemporary brand, Oober Swank. In conjunction with the Fashion Merchandising and Design program at California State University Long Beach, Project Ethos will launch the first annual Fashion Designer Scholarship for graduating seniors. Winner Jennifer Luong will premiere her boho-chic collection, Tandy Stone on the LA Fashion Week runway. DJ sets by Val Fleury and Digital will also be included.